A unique tropical healing oil that's been wild harvested from the coastline of the Northern Territory. This traditional remedy can be used for acne healing, acne and surgical scarring, stretchmarks, fine lines and wrinkles, as well as for skin conditions such as eczema and psoriasis. Powerfully skin repairing and anti-aging, this oil has many applications. Grown, harvested and produced in the Northern Territory, Australia. Supporting local business. One oil with many uses means you need less products in your bathroom. 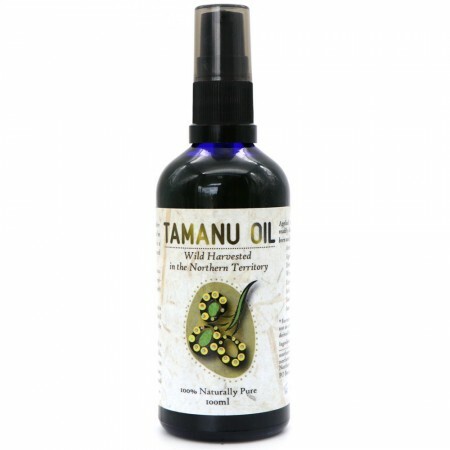 Powerful plant oil that is readily absorbed. Use from head to toe. Assists acne and acne scarring, surgical scars, stretch marks, fine lines and wrinkles. Provides relief and helps heal dermatitis, psoriasis, eczema, and general itchy and inflamed skin. Can be applied to sunburn and other minor burns as well as insect bites. Used in India topically for rheumatism. Known for its anti-inflammatory, anti-bacterial, antioxidant and anti-ageing effects. Wild harvested nut from the tropical coastline of the Northern Territory. Seeds are sun dried before processing. Has a strong caramel-like nutty aroma. Browse our other natural skin care oils. Definitely works for bites. I’m allergic to all insect bites, this is great to keep itch and swelling and redness at bay. Smells slightly nutty! Not overpowering. Also use it as moisturiser after shower!